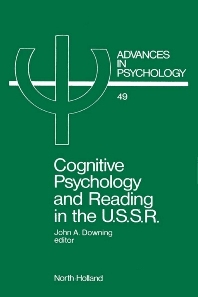 Comparative Perspectives on the Developments of the Cognitive Psychology of Reading in the U.S.S.R. (J. Downing). Notes on Russian Orthography and Pronunciation (I. Heaman). An Outline of the History of Methods of Teaching Literacy in Soviet Russia, 1917-1947 (L.K. Nazarova). A Psychological Analysis of the Process of Reading in Beginners and a Method of Teaching Literacy (L.M. Shvarts). The Pathology of Grammatical Operations (A.R. Luria). The Innovation and Development of Teaching Reading by the Phonetic Method (S.P. Redozubov). The Scientific Basis of Methods of Classroom Instruction in Reading at the Primary Level (S.P. Redozubov). Teaching Literacy in the Light of Contemporary Phonetics and Experimental Data (S.P. Redozubov). Research into Methods of Teaching Literacy (S.P. Redozubov). Problems of Teaching Literacy to Children at the Age of Six (S.P. Redozubov). Reading Comprehension in Skilled and Unskilled Readers (T.G. Egorov). Children's Mastery of Representations of Speech-Sounds (T.G. Egorov). Some Psychological Problems of the Primer Period in the Initial Teaching of Literacy (B.G. Ananev). The Process of Mastering Literacy (E.G. Karlsen). The Psychological Prerequisites for Reading Comprehension in Young School Children (N.G. Morozova). The Development of Morphological Concepts in the Youngest School Children (S.F. Zhiukov). Developing Syntactical Concepts in Primary School Students (A.M. Orlova). The Segmentation of Speech into Words by the Oldest Preschool Children (G.P. Beliakova). The Quest Must Continue (V.G. Goretsky, V.A. Kiriushkin, A.F. Shanko). Further Remarks on the Psychological Bases of the Initial Teaching of Literacy (D.B. Elkonin). Preschoolers' Awareness of Speech and Readiness for Learning Literacy (F.A. Sokhin). How to Teach Children to Read (D.B. Elkonin). Central Cognitive Themes in Soviet Theory and Practice in Reading Instruction (J. Downing). References. Indexes. The ideas of Soviet specialists on the psychology and teaching of reading are here made available in English. The volume gives an overview of psychology and education in the U.S.S.R., and presents translations of the work of major Soviet authors, such as Elkonin and Luria. The contributions offer many valuable proposals for teaching literacy which are quite unique outside of the Soviet Union. A concluding chapter provides a commentary, tracing the links between these specialist contributions and the general cognitive theories of Vygotsky. The result of ten years of research, this book was completed by Professor Downing shortly before he passed away in June 1987.